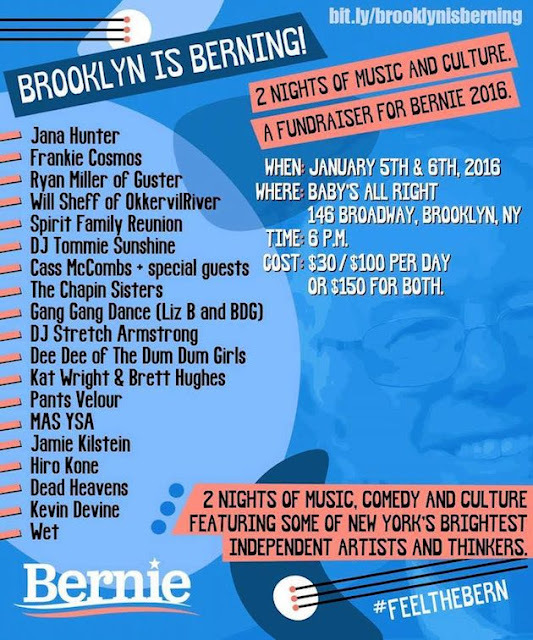 Cass McCombs, Jana Hunter (Lower Dens), Will Sheff (Okkervil River), Gang Gang Dance, Kevin Devine, MAS YSA, Frankie Cosmos, Spirit Family Reunion, and many more will be performing as part of a two-night fundraiser for Democratic presidential hopeful Bernie Sanders. "Brooklyn is Berning! - 2 Nights of Music and Culture" happens at Baby's All Right on January 5 & 6. Tickets are $30 for each night (or $100 a night as a "Super Supporter") or $150 for both days as a Super Supporter.